Having your heating and air conditioning system running at its best can save you time, money, and significant discomfort. When Williamsburg has a sudden winter cold snap or Virginia Beach experiences a blistering hot and muggy summer day, you want your HVAC system to keep your home comfortable for you and your family. 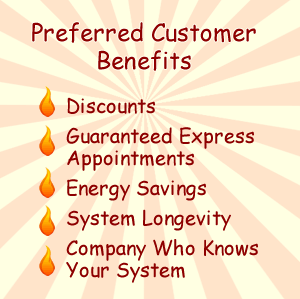 HOTBOYS takes away the worry of maintaining your heating and cooling systems with our Preferred Customer Agreements. Regular service of your equipment can save you thousands of dollars over the long haul in energy costs. In fact as much as 30% a year! Regular service can EXTEND the live of your system. Your membership will literally pay for itself year after year. You become a preferred client! You can expect our highly trained and competent technicians to become completely familiar with your air conditioning and heating equipment. Your Club Membership guarantees appointments, provides valuable FREE services and discounts on repairs.